Line a 9X9 square baking dish with foil allowing extra to hang over the sides of the pan. Spray with non-stick cooking spray. Combine melted butter and graham cracker crumbs together and press mixture on bottom of prepared pan. Bake in preheated oven for 6 minutes. Remove and place on cooling rack - leave oven on. While the crust is cooling, prepare the cookie dough using a stand mixer with a paddle attachment. Beat butter, brown sugar, sugar, salt, vanilla until smooth - about 1-2 min. Mix in the flour on low speed until combined well. Add in chocolate chips and mix. Set aside. Meanwhile, prepare the cheesecake using a stand mixer with paddle attachment. Cream together sugar and cream cheese. Mix in the egg and vanilla on low speed until well combined. Pour cheesecake batter onto prepared crust. 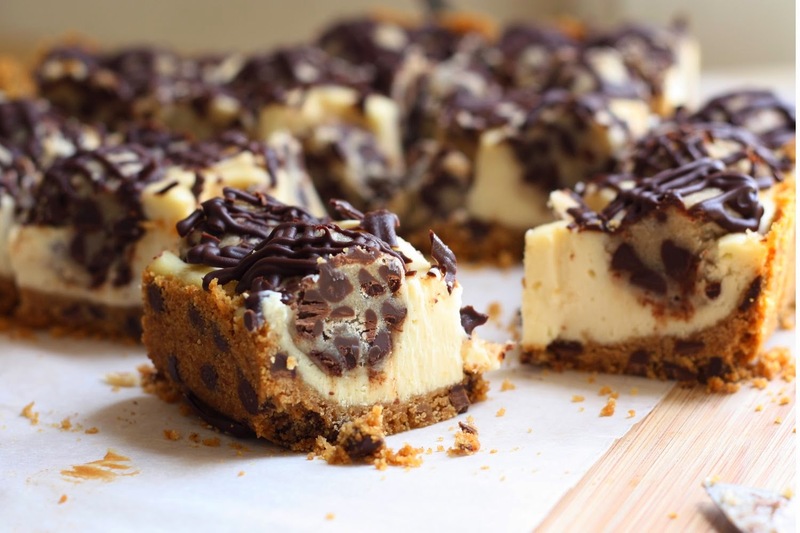 Use you hands to form small and flat clumps of cookie dough and distribute it on top of the cheesecake mix. Use all of the dough and cover all cheesecake bits. Bake for 30 min. When you remove the bars, the cookie dough will not look fully cooked - which is the way it is supposed to look. If you want the achieve more of a chocolate chip cookie crunch on top, leave in the oven for an extra 10 minutes. Move bars to a cooling rack allow to cool for at least 30 minutes. Lift the bars by the foil overhand and slice. Must store in refrigerator.